Pocket Plumber is an app that allows easier communication between home owners and plumbers during a plumbing emergency. By using the app, customers can take a video or picture of their emergency and send it to a plumber of their choice. By receiving information beforehand, plumbers can view the emergency and be better prepared. It allows them to reach the customers house with all the required tools and materials. It gives both, the plumber and customer, the benefit of not having to schedule a second apportionment and saving time and money (due to damages brought about by repair work being stalled). To decide on the functionality of Pocket Plumber, it was critical to go through an appointment making process, from the point of view of a professional plumber and a customer. It was equally important to make note of where and how the two sides of the process interconnect. It was also important to study the appointment making process from the plumbers point of view. 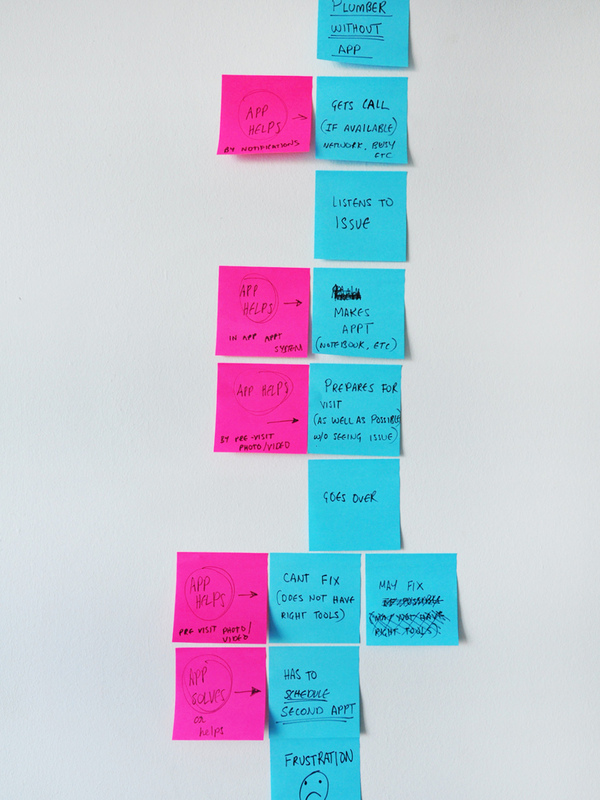 The blue post-it notes describe the steps plumbers go through and the pink notes are potential problems areas (preparedness, noting appointment etc.) an app like Pocket Plumber could solve. I researched customers making appointments with a plumber. The yellow post-it notes describe the customers steps during the appointment making process. The pink notes signify potential problem areas (noting an appointment, technical explanation etc.) where an app like Pocket Plumber could help make things easier. A scenario where a plumber uses the Pocket Plumber app to make appointments. This process also helped to point out where the app / plumber would require input from the customer side, such as providing an address or appointment time etc. Identifying the steps a typical customer would go through by using the Pocket Plumber app to report a plumbing emergency. Keeping in mind the primary target audience for the app (home owners in their 40s and 50s) the interface need to to be simple and visually easy to navigate through. The users would benefit from large and flat UI because time is short when a plumbing emergency strikes. When a plumber receives an emergency, the process needs to be quick in order to reduce damage to a customers home. It required be as few steps as possible and needed to be presented in a simple and easily legible manner. Every step of Pocket Plumber customer side interaction was sketched and annotated to make sure the user flow is smooth and no important steps were missed. Detailed Sketches of the Pocket Plumber professional side interactions.